This park was burnt over by the 2017 wildfires. 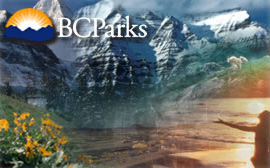 The park will remain closed until safety assessments and site rehabilitation have been completed. Post-wildfire hazards may last for several years or longer after a wildfire and may be triggered at any time with little or no warning. Dante’s Inferno Provincial Park was established as a result of the Cariboo-Chilcotin Land-Use Plan Goal 2 (Special Feature) process. It offers a number of unique recreational, ecological and scenic features. It contains a recreational lake with good early season fishing opportunities surrounded by a scenic setting of basalt cliffs. Dry old growth, Douglas-fir forests, cottonwood forests, marsh, shrub streamside vegetation, and bedrock are all features which can be found in the area. Several species of bats utilize the basalt cliffs in the area, and pikas, flammulated owls and poorwills are in the area. A very large population of aquatic and other insects are an important feature of the area and their presence is likely attributable to the relatively warm lake and vigorous shoreline (riparian) vegetation. The park is located approximately 56 kilometres southwest of Williams Lake. More information on this park will be added as it becomes available.